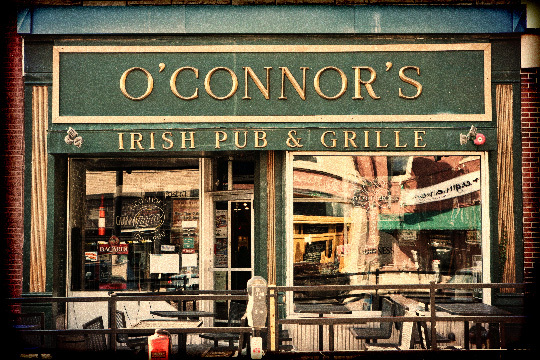 On October 10, 2015, PRISM conducted a paranormal investigation of O'Connor's Irish Pub in Omaha, Nebraska. This bar was also be featured on the Hit that Dive Haunted Hangover Tour in October 2015. Video from PRISM's investigation of O'Connor's Irish Pub in Omaha, Nebraska on October 10, 2015. O'Connor's Irish Pub - At 8:33 pm, Katie, who was sitting at one of the downstairs tables along with her girlfriends, asked any spirits to please come in to the bar and make themselves known. Immediately after that, the downstairs bar lights turned on. Of course, the women were shocked that the lights turned on right after asking any spirits to show themselves. Upon further investigation, it was noted that the light switch was located near the four women, and all four of them swore that they didn't touch the light switch. All of the PRISM investigators were on the second floor when the event occurred. At 10:20 pm Anney and Dan both felt cold spots and noted anomalous readings of 2 to 4 mG on their EMF meters. These were recorded at the front steps. The EMF zones did not stay in the same spot, and eventually disappeared. At approximately 10:30 pm, Trevor, Anney, and Katie were at the bottom of the front steps, and Katie asked any spirits present to show themselves. At that exact time, their EMF meters spiked again, and they all heard something move upstairs. What was intriguing was that nobody was upstairs, and everyone was accounted for downstairs. The three of them began ascending the stairs and witnessed a shadow figure behind the second floor bar. Katie yelled out, "Who's there?" twice, both times, there was no reply. Immediately after that, a sound was heard that sounded like someone shuffling through papers behind the bar. All three of them headed towards the second-floor bar, and Katie screamed out, "Who is up there?" The three of them then witnessed a shadowy figure run for the bar into the adjacent back stairwell, and heard what sounded just like loud footsteps running down the stairs. They were sure that it was someone playing a prank on them, but when they tried to find out who it was, they realized that the rest of the team, and Katie's girlfriends, were all together downstairs. The rest of the group had not heard heard anything, and even though they were located very close to the back stairwell, they had not heard anyone run down the steps. Throughout the night, there were several instances of equipment failure. At one point, Katie entered the kitchen and saw that several items were had been rearranged. Many investigators noticed cold spots throughout the night, and most everyone saw what appeared to be shadows moving around on the second floor of the establishment. Two Electronic Voice Phenomena (EVP) recordings from a PRISM paranormal investigation of O'Connor's Irish Pub in Omaha, Nebraska on September 18, 2005. Note: Original recording followed by a noise reduction filter added, then slowed down. On September 1, 2005, PRISM investigators David Rodriguez, and Josie R. returned to O'Connor's Irish Pub to conduct an interview with the owner of the establishment, Katie O'Connor. Other reports of paranormal activity were relayed to the investigators by various staff members, many of which included sightings of shadow figures near the entrance to the kitchen. On August 24, 2005, PRISM investigators David Rodriguez, Ralph DeStefano, and Dan Christianson conducted a pre-investigation of O'Connor's Irish Pub. Various staff were interviewed and photographs and baseline EMF readings were taken.